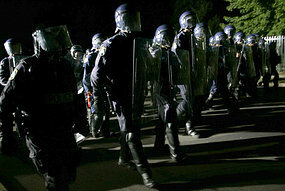 On Wednesday 24th October 2007, a coronial inquiry cleared police of responsibility for the 2005 Macquarie Fields riots. 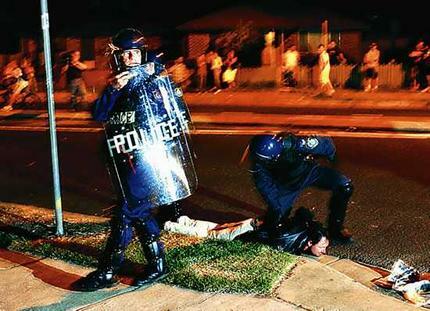 The 2005 riots in the south-west Sydney suburb of Macquarie Fields drove a wedge between the police and the community. Cars were set alight and police were pelted with rocks and petrol bombs. Members of the community blamed police for the deaths of two teenagers who died during a police car chase. But police had not been responsible, and it took two and a half years for a coronial inquiry to find it. This is the third instalment of Picking Cotton, the Nicola Cotton story. Nicola was a young police woman who was senselessly killed in an act of anti police brutality. The aim of this documentary series is to look at police and humanize them for the young. An earlier echo of the riot was at the local High School James Meehan. In 1992, the school had had riots divided along race lines existing within the local ghetto. Aboriginal and Pacific Islander students squared off after a school counsellor charged with welfare responsibility for Aboriginal students had given those identifying as Aboriginal permission for activity like smoking or leaving class. Pacific Islander students saw themselves as carrying the load of school pride when the school excelled at Rugby League. After the division, the counsellor was dismissed. The school had previously had as students those involved with killing Anita Cobby and, later, Janine Balding. Jesse Kelly, 21, was sentenced in the NSW District Court after previously pleading guilty to two counts of aggravated dangerous driving occasioning death. He was at the wheel of a stolen Holden Commodore that slammed into a tree in Macquarie Fields, in Sydney's south-west, during a police pursuit in February last year. Matthew Robertson, 19, and a 17-year-old youth died in the crash, but Kelly fled the scene, giving himself up to police 12 days later. 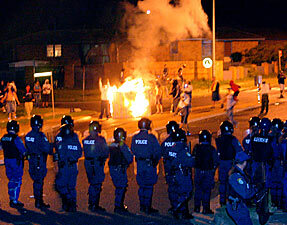 The Feb 25th 2005 incident triggered four nights of rioting between residents of the suburb and police. Jesse had started those stories after his friends had died in the car Jesse had been driving. His friends and relatives told Jesse’s stories as truth. The riots that followed involved a poorly educated and mostly high population of young people gathered into a ghetto by ALP public policy. The police were their bogeyman, because the police enforced those laws the ALP gave them. Kelly had rarely attended school. He was unskilled and unemployable. He smoked marijuana and lived with friends who drank much and smoked a lot of marijuana. "Listen, reality check," the Premier said yesterday. "There are no excuses for this behaviour and I am not going to have it said that this behaviour is caused by social disadvantage. "A lot of people grew up in circumstances of social disadvantage and they did not go out and attack police with bricks and light fires in the streets ... There is one blame here and that is the people who went out and threw bricks and caused riots. There's only one thing to say to them: the police will get them, because they are engaged in illegal behaviour." For the fourth night running, about 300 residents confronted police, pelting them with rocks and bottles in revenge for the deaths of Dylan Raywood, 17, and Matt Robertson, 19, who died when the stolen car in which they were passengers crashed during a police chase on Friday night. The trouble erupted after officers raided a unit on the corner of Cottonwood Crescent and Eucalyptus Drive which Mr Robertson had shared with three men. Witnesses said three young men and a woman were arrested nearby after the raid, in which police seized a rifle and a police baton. By midnight police had arrested 19 people, including a woman charged for punching a policewoman to the ground. At the bottom of Eucalyptus Drive, as many as 50 youths hurled fireworks which exploded at the feet of a phalanx of about 70 police. While the dead car thieves and the missing young driver got little sympathy from letter writers and talkback radio callers outside Macquarie Fields, social policy specialists criticised Mr Carr's tough talk and denial of the social causes of the riot. "He is 100 per cent wrong," said Ross Homel, a commentator on police pursuits and the causes of juvenile crime. The problems of Macquarie Fields would not be solved through a rigid law-and-order stance, but through police convincing the residents they were not "the enemy" by tackling the suburb's social ills with other agencies, said Professor Homel, professor of criminology and criminal Justice at Griffith University in Brisbane. 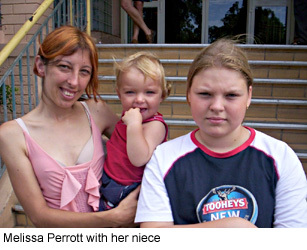 Local residents and social workers confirmed that life in Macquarie Fields can be bleak, hard and often violent. They blamed unemployment, poverty, a culture of substance abuse and a lack of infrastructure for the recent unrest. "Unfortunately, I think everyone has admitted that the estate was one of the worst blunders of the last century," said Molly Thomas, co-ordinator of the South West Multicultural and Community Centre. "They have created terrible social problems." Scott Marshall, 15, a friend of Matt Robertson, said: "We've got nothing to do here. So the cops harass us, they pull up at four o'clock in the morning and play the song Bad Boys really loud and put their sirens on. We want revenge." Empty beer bottles and cans litter the streets and parks, graffiti is splashed on most buildings, piles of discarded furniture sit on pavements and derelict houses squat in overgrown yards. Built in the 1970s, the suburb consists of 2000 public housing properties and 2900 privately owned homes. At 11 per cent, its unemployment rate is almost double that of greater Sydney's 6 per cent, while almost 17 per cent of its youths are jobless. "There's a number of people who tell me they haven't eaten for a few days. It's a reality in this area," said a Salvation Army welfare office spokeswoman who declined to be named. NSW Police Commissioner Ken Moroney today angrily defended his handling of the Macquarie Fields riots in Sydney and accused the state Opposition of politicising his job. He also hit back at frontline police officers who anonymously complained to the media about poor resources, telling them to come forward and discuss their issues with him personally. Mr Moroney launched his counterattack as visiting Los Angeles Police Department (LAPD) chief Bill Bratton described the south-western Sydney riots as "disturbances", where he saw no problem with the police response. "I am grossly affronted and insulted by the reported politicisation of the office [of police commissioner]," Mr Moroney said as Opposition leader John Brogden continued his attack on the police response. "I am not going to be an apologist for driving down crime. That's our function and I'll continue to do it." Mr Moroney admitted to being "not pleased" with some aspects of how police let crash fugitive Jesse Kelly escape custody for 12 days and let rioting continue night after night. "We will get to the bottom of the issues," he said. 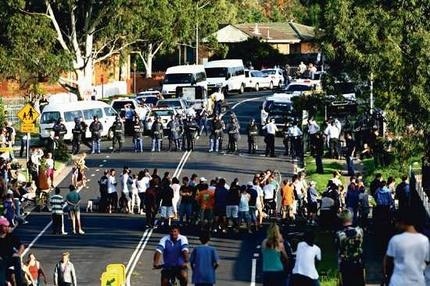 Several police officers, who have not given their names, have held Mr Moroney responsible for a lack of training and experience that undermined the response to the unrest in Macquarie Fields. "I can't deal with things anonymously," Mr Moroney said. "I'd like to be able to talk to the officer or officers concerned." Mr Moroney said he would face "any inquiry" into police resources, training and pursuit tactics, but said "nothing is to be had by nailing people to the wall". A police leadership which acted in the interests of politicians, but not its officers or the community. A Police Chief who acts as a government Minister, attacking the leader of the Opposition, but failing to defend his own methods. A community set up to be at odds with the police whose function is to protect and serve. That is the lesson of Nicola Cotton, and the Macquarie Fields riots. This would be so much better if you referenced where you got your info. But it was helpful thankyou. Anon, it is only a dump from various searches. I kept the links .. The car that was stolen in the accident was stolen from our house. We reported it to the police as soon as we knew. My point is we never got asked anything at all. The car was rented on a long term basis from Avis. The guys that stole it must of been in our house while we were sleeping. I hold no malice to anyone involved, but I wanted to say that the system is corrupt because when the police officer came to our house to take our detailsthe day after the car was stolen she knew exactly where the car was maquarie fields. They could of arrested them before they chased them which caused the crash and the deaths of two young lads. They obviously wanted to catch them driving the car. Furthermore no one ever took any statement from us, we had to collect our belongings from the car which was held in a pound. I'm just saying that the deaths could of been prevented.